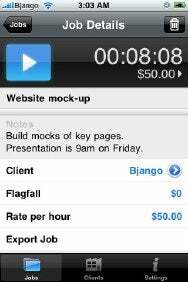 Bjango has released Jobs, a new iPod touch and iPhone app used to track time and time sheets. It’s available from the App Store for $4.99. Jobs helps you keep track of what you're working on. Jobs helps you keep track of your time, hourly rate, flagfall, client information and total time spent on a job. The information is broken up into sessions logged every time a job is paused or restarted. You can assign jobs to clients, and each client can be linked to a contact in your iPhone. You can track every session spent on a job, and sessions are created by clicking on start and pause. You can also manually add, edit and delete jobs. Jobs can also manage multiple timers. Content can be exported as a CSV or text file via e-mail, so you can import it into Excel, Numbers or any other spreadsheet app. Jobs requires an iPod touch or iPhone running iPhone 2.0 software or later.